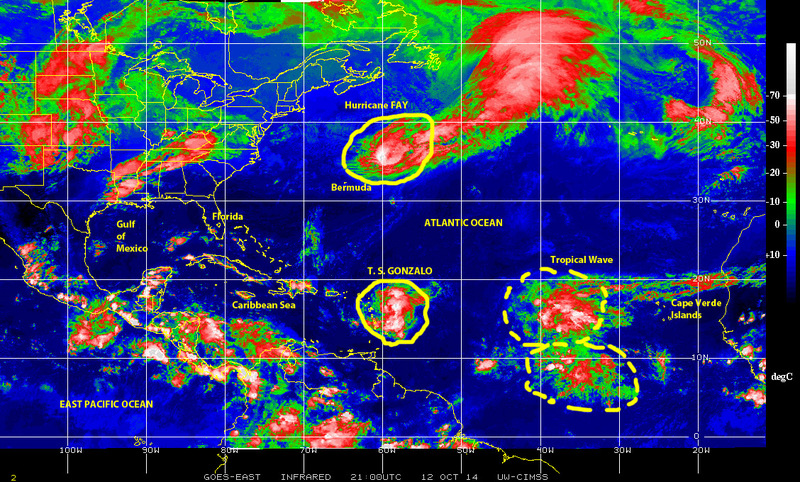 2014 Atlantic: It is FAY and GONZALO out there! The sixth-named tropical cyclone of the 2014 Atlantic hurricane season reached hurricane strength this afternoon as it brushed Bermuda. FAY has started to veer toward the northeast and eventually almost due east in the general direction of the Azores in the next day or so. Today also, the tropical wave near the Virgin Islands became Tropical Storm GONZALO, the seventh-named storm of the 2014 Atlantic hurricane season. GONZALO appears to be strengthening and it is tracking pretty much the same path followed by FAY over the past couple of days. This storm may also reach hurricane strength later on this week. In addition to FAY and GONZALO ‘hurricane alley’ and the ‘tropical wave assembly line’ across Equatorial Africa are populated by a long train of tropical waves and disturbed weather cells marching westward. It is quite possible that these seeds of cyclonic activity may fuel additional cyclonic development in the Atlantic in days to come. All interests around the North Atlantic basin, from the Caribbean, and the Gulf to Florida and beyond, must remain alert monitoring all of the current and potential cyclonic activity closely over the next few days. Remain alert, be prepared, MITIGATE!